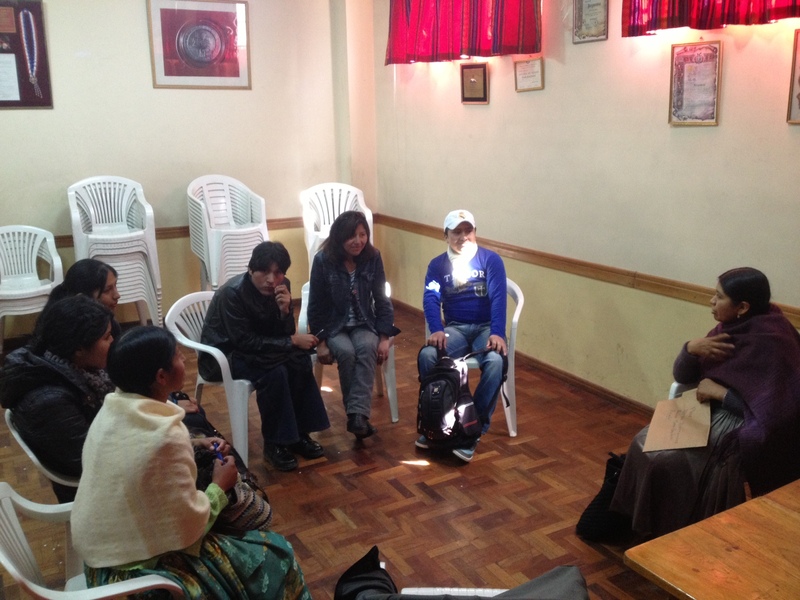 The Lingua Airwaves Project funded by the GV Innovation Grant kicked off its activities with two meetings in El Alto, Bolivia on June 8 and 15. 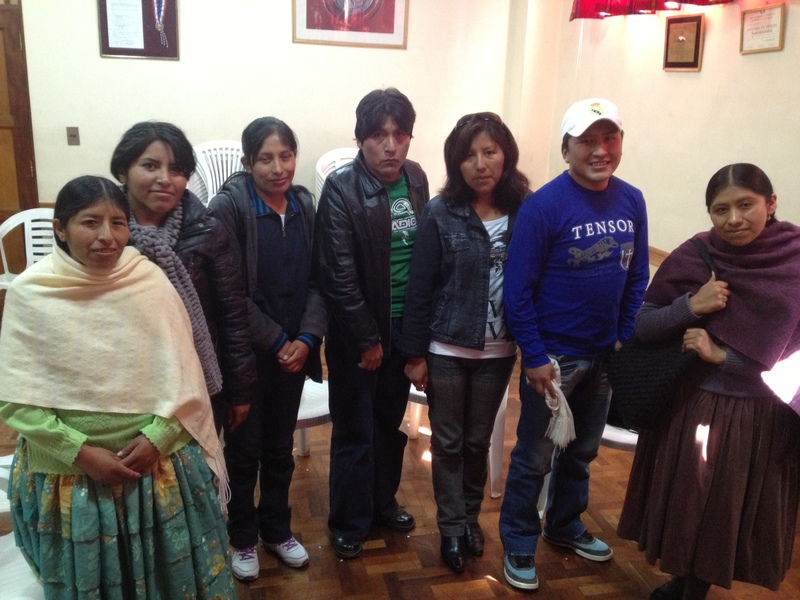 Attended by translators and editors from Global Voices Aymara, they were joined by a new addition to the project team. Members of GV Aymara at the first Lingua Airwaves project meeting. She agreed to be a part of the project and provide her expertise on creating content for the radio. In addition to helping create scripts for the radio, she will advise the team on proper on-air voice techniques. At the first meeting, the team discussed possible formats for the GV Aymara articles that would be adapted for the radio and audio podcasts. It was decided that the translation articles could not be directly read and recorded because much of the context is contained in the hyperlinks, and they are written for people that understand that the cited quotes are from bloggers. Discussing formats for adapting GV translations. Another important factor that was discussed is the composition of the audience. The majority of listeners of radio stations in El Alto are not as familiar with global issues in comparison to regular GV readers. This will be another issue to keep in mind as the news is adapted for this audience. It is also important to attempt to relate the subject matter to the audience and make it easier to understand within the context of the voices from citizens on the web. Before the 2nd meeting, it was learned that the Director at the radio station that had approved the collaborative project had left for another job. This may alter the plans to work directly with that radio station because he was a key ally in the project. We will wait to see if another director will be as open to the partnership. However, it was decided that the audio formatting and recording element to the project will proceed as originally planned. Alternatives to that particular radio station will be explored, not only in Bolivia, but also Peru and Chile where Aymara is spoken. As part of the grant, the first set of digital audio recorders were purchased. We will be using the Olympus LS-10S along with a Sony ECM-MS907 external microphone. For the next meeting, the team is selecting potential articles that can be adapted for the radio and audio podcasts. It was determined that the ideal story would be from Bolivia or Latin America, where more listeners would already be familiar with the subject matter, as well as other articles that are not time-sensitive related to current news events. This entry was posted in Grant Updates, Lingua Airwaves on June 25, 2013 by Eddie. Thank you Eddie for the update – it is so exciting to see this project coming true! Sorry to hear about the changes in the radio station that might interfere with the plan and I hope the new director is just as enthusiastic as the past one. An idea that came to my mind was to provide an open source program that any radio could use? Perhaps this could be even better. Thanks for the update! I hope the team in Bolivia is aware that we’ll be looking at what they produce as a potential model to copy in other languages too. Even if the initial recordings were to receive limited circulation (I hope the radio station will still be interested!) they’ll have a captive audience in GV who will be looking to learn from their work deciphering GV posts for an audience less familiar with global events. Good luck guys! I know you will be doing a great job!